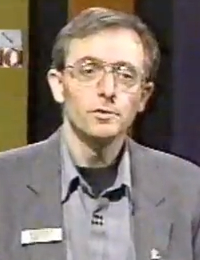 On May 28, 1999, during the Ontario general election, Freedom Party of Ontario president Robert Metz was a candidate in the televised candidate debate for the riding of London North Centre. Other candidates included Andrew J. Jezierski (Family Coalition Party), Dianne Cunningham (Progressive Conservative Party), Jeff Culbert (Green Party), Roger Caranci (Liberal Party), and Marion Boyd (NDP). Calls from viewers included: leadership ability, tuition hikes, a strong & mandatory Ontarians with Disabilities Act, cuts to health care (including womens’ shelters, hearing impaired, drug rehabilitation). The moderator was Gord Harris, who concluded by asking each candidate to identify what is the single most important issue brought to each candidate’s attention by constituents, and what is the client’s proposal to deal with that issue.